One of the most prized possessions that many of our History and Archives Committee members have is the “Girl Scouts Make History” pin or charm. I am often asked, when wearing my charm on a necklace to Girl Scout events, where I got my charm. The second question is if they are still available. We are happy to say that they are. The design of these charms and pins was created in 1989 by Shirley Barentine, one of our original History/Archives committee members. 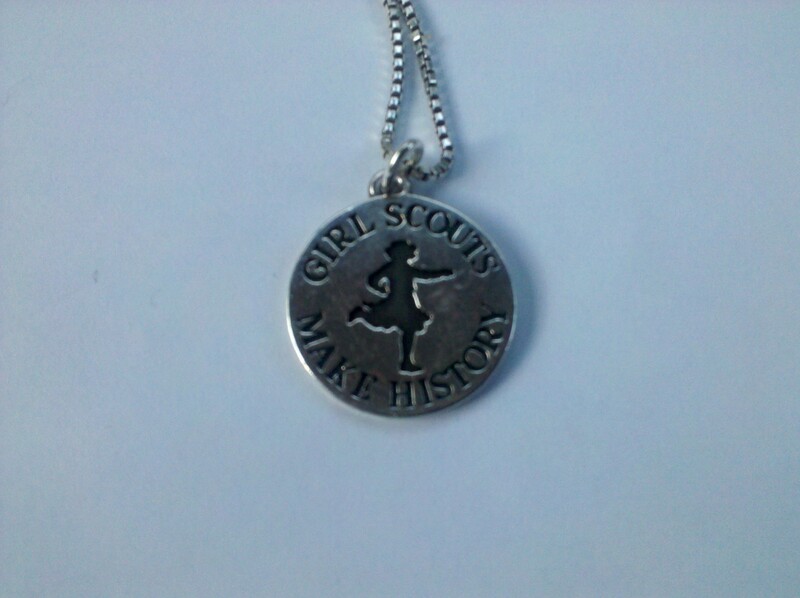 The sterling silver pin and charm measure 3/4 inch in diameter and is a great way to honor our Girl Scout heritage. Use this Pin/Charm Order Form to purchase wonderful gifts for the holidays or in time to wear for 2012. All the monies raised goes towards preserving and making accessible the history of the Girl Scouts of Greater Atlanta Council. You can make a difference! Posted on November 26, 2011, in History / Archives Committee and tagged charm, committee, pin, postaweek2011, running girl. Bookmark the permalink. 1 Comment. Do you still have these available? Thanks in advance!